To go live with your custom domain name and HTTPs you'll need to set up a CNAME or also known as an alias record. 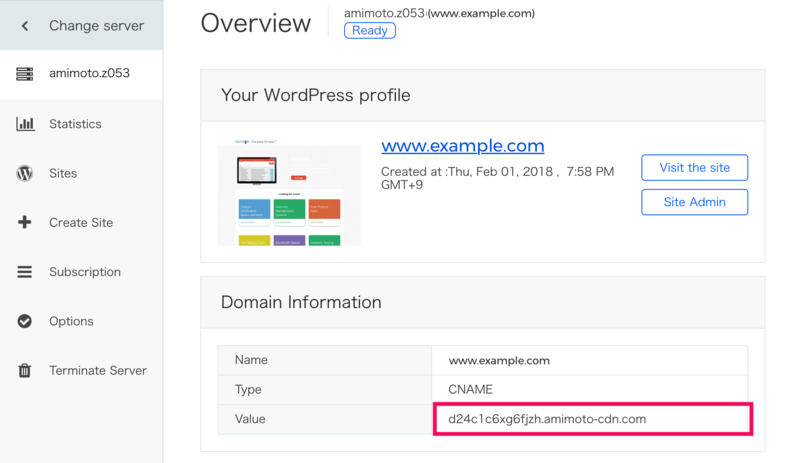 This alias will allow us to mask your unique AMIMOTO domain with your custom domain name. Whether you're using Route53 on AWS, Network Solutions, Hover or one of the other many DNS and domain providers you'll need access to your DNS settings. You'll need to add a new CNAME record. The name of the record is the desired domain name, in our case it's www.example.com and your unique CloudFront URL as the value. Where / what's my CloudFront domain? The domain you will need to create this CNAME record is located on the the main server settings page. If you're setting a staging environment you can create a CNAME record for that staging domain name. For example if you were using, staging.example.com, you would need to request a cert for that domain, approve it and attach it. After it's available and attached, you can update your DNS settings with the CNAME record and the staging domain you'd like to use. Please note, you can always use the issues CloudFront URL as a staging domain name. In this example we are using https://www.example.com. To go live you'll need an approved certificate, attached to the site and finally update the DNS records. If you have questions or experienced issues during this process, let us know!